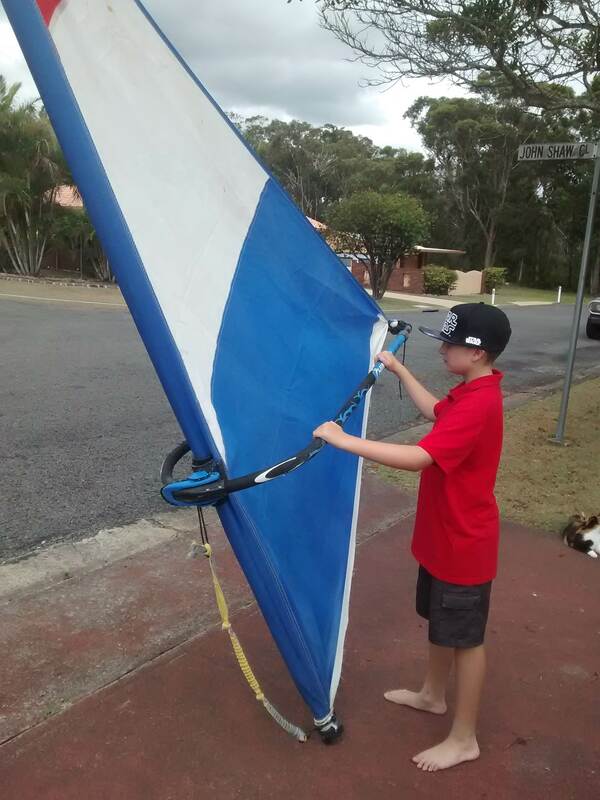 With the Xmas holidays upon us, and two young kids (10 and 13) keen to do what ever Dad does, I set about creating a super inexpensive rig that would keep them amused and not fall apart in 5 minutes. The objective- easy, cheap and light. The end result was this fancy, super high-tech creation. No idea what the size it- perhaps 2.5 to 3 meters, but it weighs very little (Boom is the heaviest part), has some shape about it with a breeze, and so far has clocked around 1 kay of back and forth flats cruising on Trial Bay. Big smiles all around, and hopefully the next gen of North Coast sailors blasting across the bay. First chop up your odd jewfish rod (an old Snyder FSU5120), then glue in a short length of alloy tube- 400mm length of old gaff handle. This slide into the rod blank, and was perfectly snug inside the mast base tube. Araldite alloy into rod blank, leaving 200 mm exposed. In pic alloy tube is inside a plastic sleeve, which effectively takes up the difference between rod blank and tube diameter. Masking tape would have done the same job. 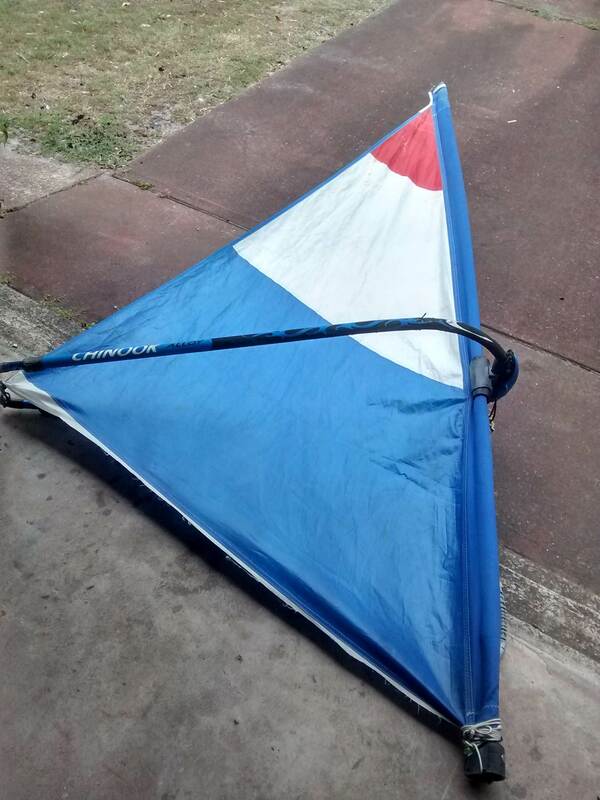 Next dodgy step, find an old sail you hate, cut it down to size, cutting below one on the batten or join stitchings. Work out the rough height for the youngsters chest / shoulder area then cut a slit in the pocket to get the boom clamp thingy through. Then I used an RDM sleeve to take up some off the gap. Surprisingly by clamping pretty tight the boom was very snug, not moving at all. Then add you lightest boom. 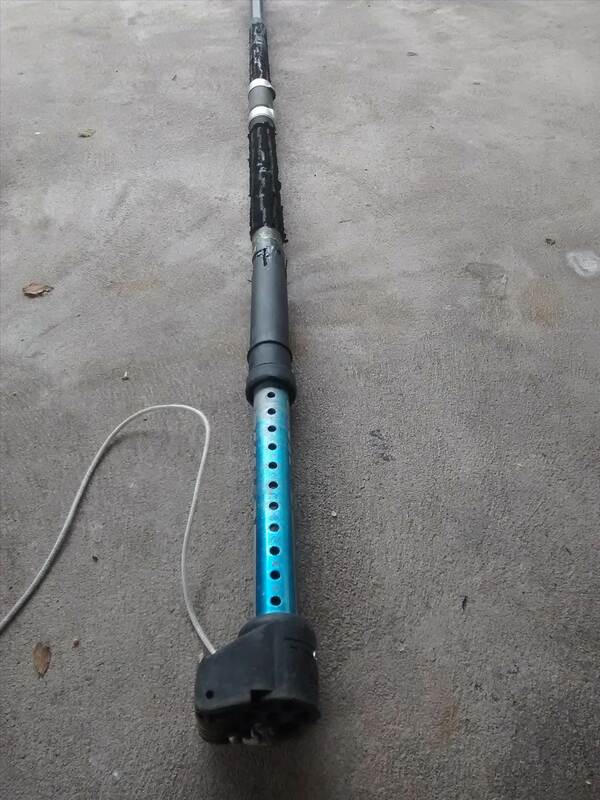 I just used my old alloy Chinook wave boom. Yep, definitely the heaviest part of the rig, but my 10 year old can up haul it very easily. Didn't use any fancy eyelets for down and out haul (though that would be a good idea), I just punched a hole punch through the heaviest stitched section off the sail down at the extension, and used the old school camping trick used for guy roping out tarps without needing eyelets. 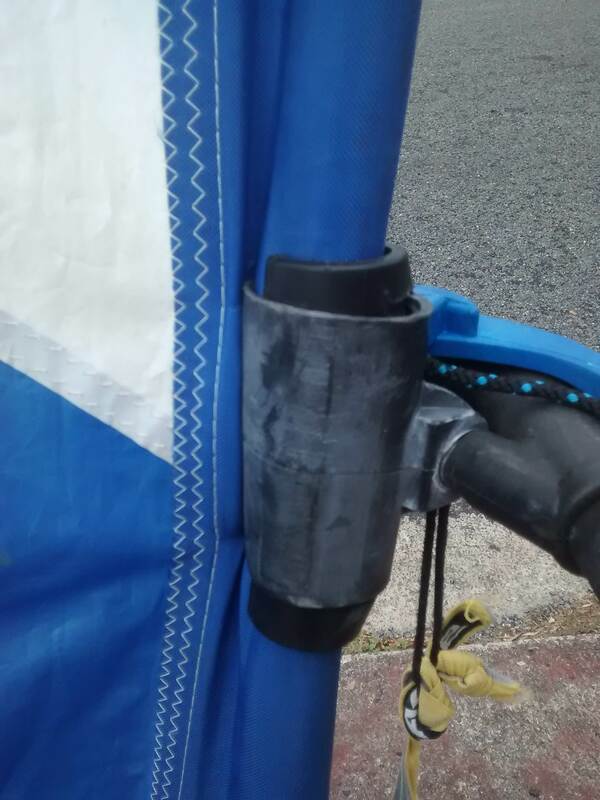 Basically you put something round and smooth into the sail / tarp, wrap it with the sail, then put a half hitch in the out-haul rope behind it, then apply some out-haul. Easy, worked well. Ended up borrowing an old formula board of a mate. Works great, super stable. Even had a few runs on it myself. Thanks Mitch.